Italian painter. He was the son of Tommaso Paolini and Ginevra Raffaelli, both from Lucca. In 1619 Paolini s father sent him to study under Angelo Caroselli in Rome. His artistic formation was also influenced by the circle of Italian and, especially, northern European followers of Bartolomeo Manfredi, who were active in Rome between 1620 and 1630. The following works, though undocumented, may be dated to this Roman period: Martha and Mary Magdalene (Rome, Galeria Pallavicini), the Concert of Female Musicians (Malibu, Getty Museum) and the Bacchic Concert (private collection). Paolini s first religious works, such as the Deposition (Lucca, S Frediano), as well as many portraits, also show signs of Roman influence. Around 1628 he went to Venice, where he stayed for two years. 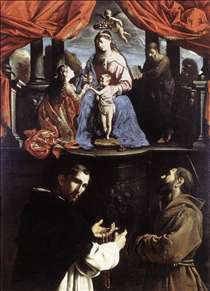 The effects of this visit can be seen in his later religious works, such as the Virgin and Saints (Rome, Palazzo Barberini) and the Virgin and Saints (Lucca, Villa Guinigi), and also in his history paintings, such as Esther and Ahasuerus (Denver, Art Museum). He returned to Lucca in 1631, where, from these early experiences, he created an original style, in which he painted cabinet pictures, often on musical or allegorical themes, such as the Ages of Life (private collecton) and the series Music, Astronomy, Geometry, Philosophy (private collection). Around 1650 he opened, at his own expense, an academy based on the principle of art from nature , at which numerous artists, such as Girolamo Scaglia, Antonio Franchi, Simone del Tintore and his brother Francesco were trained. Paolini introduced still-life painting in Lucca, for example Still-life with Flowers, Fruit and a Dove in Flight (Potenza, Palazzo S Gervasio), a genre with which he had considerable success. See more details about "The Mystic Marriage of St Catherine of Alexandria"